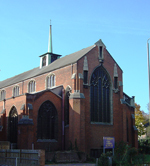 St Barnabas is an Anglican church in the heart of the Southfields Grid. St Barnabas welcomes young families and has a number of child-friendly facilities throughout the Church including a crèche, Sunday School,Youth Group, Drama Group and toys on hand! The journalist Suzanne Moore recently wrote an excoriating article about the state we are in. Among the thoughts that jumped out at me, was that older people should be cautious about blaming the mental health of young people on their addiction to social media and the gadgetry which connects them to it. Perhaps the world that we have created and will bequeath to them is more to blame. One of austerity, nationalism, anti-semitism and frantic business. A culture where only the best are valued and only the richest can afford to buy a home or pay rent. In a world rapidly losing its wild life and over -heating. What really can we expect ? A preoccupation with social media might be a symptom rather than a cause. As you are aware, I am a bit of a convert to twitter. As well as being a useful way of getting in touch with and conversing with people around the world with common interests, but it also provides a window into the soul of thousands of people. And there is a lot of nastiness and stupidity there, but also inspirational and enlightening content. The patience and politeness of the Rabbis’ is astounding. What we know as Fundamentalism is as far as I know non- existent in the Jewish tradition. Scripture is approached not as a source book for rules or dogmatic certainties, but an inspired resource to help humans understand themselves and their relationship with God. It is ironic that the very same Christians who most often allege that Judaism is about rules impose that very model on Scripture while the Jewish thinkers creatively explore the complex interplay between the written word and religious tradition and the lives we live. Unsurprisingly we find Jesus doing just this too. In Matthew’s Gospel we hear of him trying to deepen people’s practice of fasting and charitable giving. He is not criticising the conventional practices, just saying don’t show off; just do both. The prophet Isaiah, in that brilliant passage from chapter 58, is not saying don’t do and cherish the normal religious rituals, but rather remember that they have a social and political dimension to. Religion is not about the pieties he insists, it is about the actions which reveal the understanding of life and God that they really have. Charity and justice are not add-ons, they are essentials, he insists. Jesus is saying you must believe in your heart what you do. Isaiah insists that you must do what you believe in your heart. They are not contradicting each other, but reminding us of the two sides to loving God and neighbour. That is always good advice. I don’t like the term virtue signalling because it is used as a term of abuse by people with a specific political leaning, but there is no doubt that we human beings always find it easier to look and sound virtuous than actually make the sacrifices and efforts involved in the real thing. Which brings me back to Jesus’ teaching about fasting. Now that Lent is virtually ignored even by Christians maybe we should deliberately be more transparent in our fasting and self- denial. Not to blow our own trumpets, but because solidarity and visibility are very effective in getting people to notice and join in. Just look at the success of Veganuary. We can’t argue that restraint of consumption isn’t needful. Maybe God is calling us to acts of conspicuous non consumption. And finally, picking up where I began, about creative uses of Scripture. What about that image of dust ?When we are ashed, we hear those words. In Genesis 2 we are told that God created all life from the dust. From the earth. With modern physics in mind many thinkers and poets have recently started rejoicing in our origin as stardust. But maybe it would help us to recall that connection with soil. We are made from the same stuff as stars but we have the same source as all other living things. We are fragile like them, we are short lived as they are. We are precious to God, as they are. We return to the earth as they will. When we are feeling arrogant, or isolated, this sense of being held in existence by God, by grace, might help to re-orientate us and comfort us. Welcome to St Barnabas Church! We aim to be an inclusive church and welcome newcomers to join us at any of our services. We are privileged to have such a special place in a vibrant community like Southfields. I hope you find all you are looking for from this website and look forward to welcoming you to Church in person soon.